Hydrogen peroxide (H2O2) and nitric oxide (NO) are biological messengers that control a plethora of physiological functions integral to plant biology such as seed germination, growth, development, flowering, or plant response to stress. Furthermore, the interplay between the signaling pathways governed by these redox molecules has emerged as crucial during plant response to different stress situations. In recent years, to gain in the knowledge of the mode of action of these signaling molecules at molecular levels, different NO donors and H2O2 have been used in medium- and large-scale transcriptomic analyses including microarray, cDNA-amplification fragment length polymorphism (AFLP), and high-throughput sequencing (RNA-seq technology). Following this strategy, a high transcriptional reprogramming induced by both NO and H2O2 has been proposed. In this regard, thousands of NO- and H2O2-cell targets have been identified in different plant species and organs and predicted to be related to a wide diversity of biological processes. However, some authors have identified by comparing different transcriptomic analysis that there is a low overlap in the transcriptomic data available under different treatment conditions as well as different organ analyzed. In this sense, more transcriptomic data comparisons will help in the identification of the NO- and H2O2-specific targets and even the common genes involved in both H2O2- and NO-dependent signaling events. 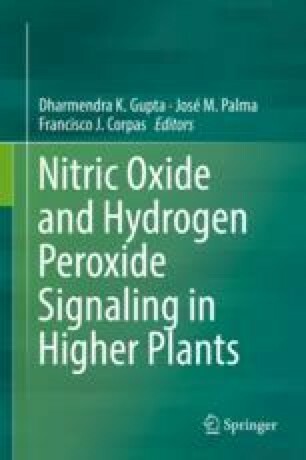 In this book chapter, we will offer an update about the recent knowledge concerning the transcriptional regulation induced by NO and H2O2. With this purpose, the recent data from the different medium- and large-scale transcriptomic analyses have been discussed. In addition, it is also provided an overview about the interplay between H2O2- and NO-dependent signaling mechanism and the need to further identification of common targets during the coordinated response to different stress situations. JCBM wishes to thank the Ministry of Economy and Competitiveness (Spain) for postdoctoral research funding within the Juan de la Cierva-Incorporación program. The work in our lab is supported by the ERDF grants co-financed by the Ministry of Economy and Competitiveness (projects BIO2015-66390-P) and the Junta de Andalucía (group BIO286) in Spain.